Photo source: Copyright © Admir Idrizi Aljabak. Used with permission. The Gorani, meaning Highlanders, is an Islamic ethnic group which inhabits the Gora region, located between Albania, Kosovo and Macedonia. Another autonym of this people is "Našinci" which literally means "our people". They are also known among the neighboring Albanians by several exonyms, "Torbeshë" and "Poturë". 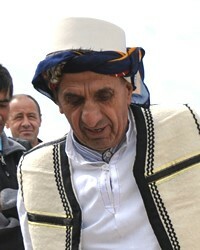 They speak the Gora dialect, which is known by many Gorani as "Našinski". The Gora region comprises Dragaš municipality in Kosovo, Shishtavec municipality in Albania and the area around the Šar Mountains in Macedonia. They are adherents to Islam and have a rich and varied folk culture. They have been claimed by Bosniaks, Serbs, Bulgarians and recently Macedonians, but the general view is that they should be treated as a distinct minority group. Some of these people are already albanised. By the last censuses at the end of 20th century in Yugoslavia they have declared themselves to be Muslims by nationality. In Republic of Macedonia their identity is also based mainly on their religion. The word Gora is a the traditional term for the region. It means "Mountains" or "Highlands". In the Gora dialect the "Mountain people" or "Highlanders" are known as Goranci (Cyrillic: Горанци), this is often transliterated into English simply as "Gorani" or "Gorans"
The Gorani live in the northern slopes of Sar Mountain and the intersection of Kosovo, Albania and Macedonia. Gorani in Kosovo today live in the villages of Backa, Brod, Dikance, Globocica, Gornja Rapca, Krushevo, Kukaljane, Ljeshtane, Ljubovishte, Mlike, Orcusha, Radesha, Restelica, Veliki Krstec, Vranishte, Zli Potok, Mali Krstec, Donja Rapca. There are also nine villages in northern Albania, along the border with Kosovo. According to the information in the municipal area and its surroundings Dragash there are around 12,000 or 13,000 in other countries. The Gorani people are Muslims by faith. But their traditions and customs are full of pagan elements. During wedding festivities the bride is carried on a white horse covered with a scarf and an umbrella that is decorated for the occasion. The bride accompanies her family to the neighbor's house of the future husband. - What is the matter? Why are you cheerless? - How can I be happy when I am alone at the end of the world and as such no one will be with me. - Do not be sad, I will send you people. It will be sad and happy for you. The question of origin of the Gora population attracts many more decades authors from the Balkans and beyond. Special interest intensified during the breakup of Yugoslavia, in fact, over the past twenty years. Many authors wrote about the Gora region in their historic and political or anthropo-geographical research. Very often their positions were mainly one-sided and tendentious conclusions. View Gorani in all countries. Location in Country: Gora region - the triangle between Albania, Kosovo, and Republic of Macedonia.